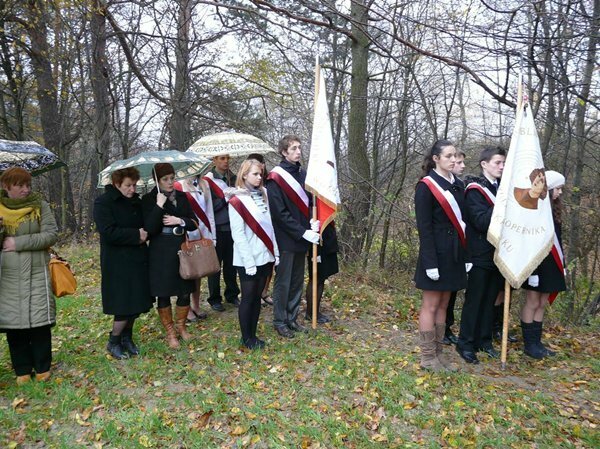 At the initiative of the Lasting Memory Foundation, in the woods in Rozwadówka next to the burial place of 9 Jews executed by the Germans on 15 December 1941, there took place the ceremony of unveiling a memorial stone. The ceremony was attended by the residents of Rozwadówka, students from schools in Sosnówka and Motwica, the youth from Rishon Le-Zion in Israel as well as other guests. In the School Complex in Sosnówka, Zbigniew Niziński delivered a lecture and held a meeting with a 90-year-old witness to history, Mr. Józef. The teachers and students heard the stories of the lives of 20 Jewish families who had lived in the nearby town of Rozwadówka before the war. The participants learned about the events of December 1941 when the Germans in Sosnówka executed 7 Poles who were held hostage and 10 hostages in Rozwadówka, including 9 Jews.